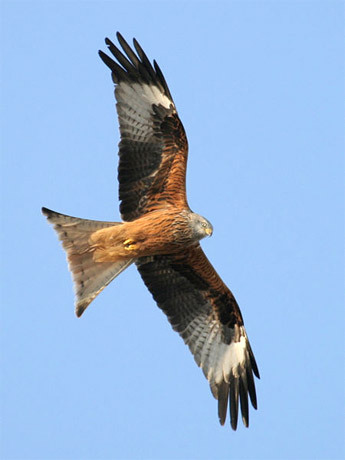 A pair of red kites is nesting in a tree in a quiet corner on the edge of my village. There has been quite a lot of coverage lately about the way that these beautiful birds have multiplied with a lot of help from various conservation bodies. The local paper, the Rutland Mercury, carried some features and letters about the extent to which they may, or may not, prey on song birds. Personally, I doubt if a large kite, which seems to be quite a slower flier, could make much impression on a small fast-flying bird. The kites that I’ve observed seem reluctant to get down and into the denser cover of the hedges and little woods round about, keeping to the open fields. My village is on the south side of Rutland Water, near the border with Northants. We’re set quite high, and I think the kites use the thermals that spiral up from the Welland Valley… certainly it is an almost daily sight, a red kite wheeling above the village, sometimes as low as 15 feet or so above the roofs. This morning I stood quietly about 10 yards away from the tree where the nest is. One adult was off hunting, the other was on the nest when I arrived, but launched after I’d been there for a few minutes. The nest is too high and well hidden in the leafy tree-top to be more than a blob in the canopy, but I did hear a youngster call when the adults were flying overhead. Not wanting to hang around and make a nuisance of myself, I left after no more than five minutes, so they could continue to hunt – and be comfortable about returning to the nest before the next rain shower hit.